For media inquiries or to be added to our mailing list, please contact our Communications Division, 512.463.6255. The Texas Historical Commission announced grant recipients for Round X of the nationally recognized Texas Historic Courthouse Preservation Program (THCPP) during its April 27 quarterly meeting in San Felipe. The THC awarded matching grants totaling $19,713,303 to 15 counties to aid in preservation of their historic courthouses, including four grants to undertake full restorations. The San Antonio downtown and River Walk Historic District in Bexar County was recently listed in the National Register of Historic Places. 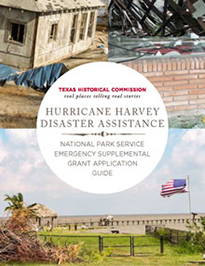 Owners of historic properties or archeological resources in Texas damaged by Hurricane Harvey can apply for grant funding from the Texas Historical Commission. Registration is open for REAL PLACES, the Texas Historical Commission’s historic preservation and heritage tourism conference, which encourages and unites individuals or communities who are passionate about seeking out, saving, and leveraging the real places and real stories of their communities.